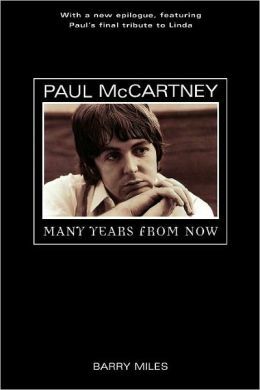 Paul McCartney has never written an autobiography; because of that fact, his life has been documented mainly by two solid, though both flawed books by authors Howard Sounes and Peter Ames Carlin (links are to my reviews of those books). However, in the early 1990s Paul began working with an old friend of his from London's 1960s counterculture scene named Barry Miles on a book project that would set the record straight on his life and work in the Beatles during the 1960s. Written based on hours and hours of interviews Miles conducted with Paul throughout the early to mid-1990s (including during the making of the Anthology), the result is an authorized look at Paul's life that's not quite a traditional biography or autobiography. Much of the impetus for Paul doing this book was to present his life story, especially during his time in 1960s Swinging London. He intended to counter the prevailing wisdom since John Lennon's 1980 murder that lazily put forth the theory that John was the only true talent in the Beatles and the only partner in the Lennon/McCartney team who was more than a conventional pop/rock musician. Even though knowledgeable Beatles fans know that this isn't the case and that Paul certainly did bring the avant garde and outside artistic influences into the Beatles' music earlier than John did, the general public tends to buy into the "John = smart & creative, Paul = cute & trite" stereotype. Furthermore, Paul decided to go through the Lennon/McCartney catalog one song at a time and explain the genesis of each one and assign how much he and John each contributed to them. For instance, a song like "I Want to Hold Your Hand" he credits as 50-50 while another song like "Norwegian Wood" might be tilted more like 70-30 in John's favor. While this wasn't the entire scope of the book, it was definitely a dominant thread that ran throughout and made the book rather unique...more on this later. The book, alternating between Miles' narrative and Paul's firsthand recollections, starts with Paul's birth in WWII Liverpool and goes through the well-told tale of his childhood, the death of his mother when he was fourteen, and his teenage years as he became obsessed with music and learned to play guitar and piano. There's nothing too new shed on his adolescence and early collaborations with John Lennon, although it's nice to read some firsthand accounts from Paul about those early years. Likewise with the early Beatles era, their time in Hamburg, and Ringo joining the band in the summer of 1962. There is quite a bit of light shed on John and Paul's early songwriting efforts that are fascinating to read, and Paul shares a lot of great little stories of times he had with John as they built the foundation of their partnership both as friends and collaborators. The meat of the book is taken up describing the Beatlemania years of 1962-1970 and Paul's life and experiences living in London during this incredibly creative and exciting time. He discusses his forays into avant garde music, art, theatre, and the general scene where rich aristocrats and heirs/heiresses mingled with musicians, painters, writers, designers, and anyone else who was part of the "in" crowd. There are a lot of memories from his times with his fellow Beatles, the Rolling Stones, the Who, Robert Fraser, Barry Miles, John Dunbar, and many more notable people from the 1960s London underground scene. He is also quite open and honest about his relationship with Jane Asher (although as has been his wont, he doesn't dish any dirt) as well as how he and Linda met and eventually married. Overall, there's a nice balance between his life and the song-by-song examinations of how much he and John each contributed, although frustratingly the book ends with the break-up of the Beatles in 1970 and the subsequent trial to dissolve their partnership in early 1971. There is an afterword discussing his feelings on John's murder in 1980, his forays into painting, a short section on his career in the 1980s and 1990s, and a final heartbreaking epilogue where he pays tribute to Linda, who tragically passed away in 1998 after after a long battle with cancer. The pain he felt when he wrote it, especially after thirty years of marriage and four children, is palpable enough to bring a tear to the eye as are his final thoughts on his friendship with John. Many Years From Now has suffered some criticism since its publication in 1998, mainly from those who think Paul tried too hard to settle the score and prove that he was as cutting edge and talented as John. The major dissenting views claim that Paul seems too pushy and upfront about his contributions, almost bragging, when they feel he has no need to. Personally, I disagree with these criticisms...not over his tone, which I do admit sounds quite pleading or desperate in some spots, but rather with their sentiment. As stated above, Paul has had to contend with most of the general public accepting the incorrect narrative put forth by the press since the early 1970s, and especially since 1980, that he was a lesser talent within the Beatles than Lennon and really, the only way he could ever counter this is by laying out all of the facts in this book. While it can come across as literally trying to keep score (especially with how he assigns percentages to just about every Lennon/McCartney song), I feel that it's justified and honestly, if you're enough of a Beatles and McCartney fan to be reading this book, you already know the true extent of Paul's contributions and should find the song-by-song analysis interesting. This is especially true when he discusses the more mundane aspects: there have been innumerable books describing the influences behind the songs and Paul doesn't really get into that too much. He spends more of his time describing where they wrote the songs, what kind of mood they were in, and other small but charming details that almost place you there in the moment when all of these great songs were created. Miles' writing for the most part flows nicely and is enjoyable although he does get into some long-winded and sometimes tangential discussions on many of the other London underground scene figures he and Paul socialized with. Sometimes these seem too in-depth and off piste to be included in a book about Paul, but at the same time it's fascinating stuff which helps the reader gain a deeper sense of context for 1960s London. In all, I can't think of any reason serious Beatles and/or Paul fans wouldn't enjoy this book. While it would have been really nice for Miles and Paul to go into more than just a few paragraphs worth of detail into his post-1970 life and career, the most important part of his career is covered here in great detail and straight from the man's own mouth. For that reason alone, it's absolutely essential reading. Yes, for me it doesn't matter too much who wrote what, I'm just glad they did, and after all I think they were true collaborations. But I can understand a bit why Paul might like to set the record straight. Given a choice between Paul's solo work or John's, I generally reach for one of Paul's solo efforts. He had many good albums, which furthered his prowess as a songwriter. Agree with you on Paul as an overall better talent and success over John. Together, in the Beatles, they were unbeatable. But I completely understand why Paul had to write this book...the media, John (initially, in the early 1970s) and Yoko have spent the better part of 40 years shaping the narrative so that Paul is the sappy, smiling guy who did little more than right love ballads, shake his hair for the girls, and give the two thumbs up, while John is the edgy creative one. Of course true fans known this is not true but the general public had no problem accepting this narrative and perpetuating it. Paul set the record straight with this book and I'm glad he did.